There was a wedding in Cana. Jesus, His disciples and His mother, Mary were all invited to the wedding. 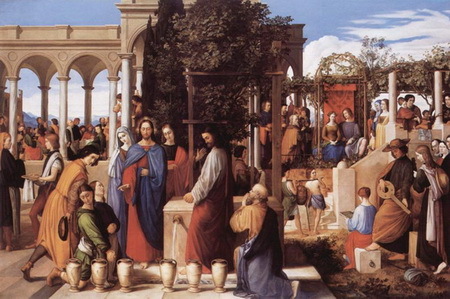 There were many people that attended the wedding in Cana. There were six large stone water pots outside. Each stone water pot can hold up to twenty to thirty gallons of water. The stone water pots were used to be filled with water so that the Jews can perform their religious duty and wash themselves. The servants did according to what Jesus had told them. They filled the six large stone water pots with water. The servants took some water out of the water pots and brought them to the master of the feast. The master of the feast tasted the wine and realized that the wine tastes very good but he don’t know where it came from. This is the first miracle that Jesus performed which is at the wedding banquet in Cana. It manifested His glory and His disciples put their faith in Him.